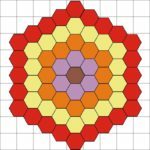 Grandmother’s flower garden quilt block is made up of concentric rows of brightly coloured hexagons. This quilt block has been a popular pattern for many years with innovative pioneer women using what they had to keep their family comfortable and warm. Since the property owner is a grandmother of eight and an avid gardener, especially flowers, it makes this quilt block a natural choice. The barn which was built in 1839 makes a rustic backdrop for the barn quilt.